Part three of a four-part series. Read parts one, two and four. TEL AVIV, Israel -- Personal "mobility pods," electric scooters, cars that run on air and even drones are all part of the strategy here to move 60 percent of Israel's transportation sector off oil by 2025. With a population of 8 million, Israel is far from the largest oil user in the world. It's also much less automobile-dependent per capita than the United States and most European countries. But despite its relatively small footprint, the self-styled "innovation nation" has grand plans to drive oil out of the global transportation sector, cutting greenhouse gas emissions in the process. To help realize this goal, the prime minister's office launched the Fuel Choices Initiative in 2010. It is a government program to help reduce dependence on oil by establishing Israel as a center of knowledge, industrial best practices and alternative transportation. The 10-year program is intended to serve as a catalyst for early-stage companies by supporting everything from basic research to the commercialization of projects. In the last 18 months, the initiative has registered more than 800 entrepreneurs, more than 130 researchers and more than 100 startup companies working on a variety of projects, from new engines and energy storage technologies to data-driven eco-driving programs. Eyal Rosner, chairman and director of the Fuel Choices Initiative, said the program's primary role is to act as a facilitator for startup companies so clean transportation solutions can get to market faster. "We try to provide them with everything they need to succeed," Rosner said. "If they need funding and they're incapable of getting it on their own, we provide funding. If they need a better regulatory environment, we do that. If they need a pilot, we will help them on that. Sometimes we help them by just connecting them to an international giant. That's basically what we do." Some companies' solutions are decidedly futuristic, like AutoMate's concept for private mass transit pods that can both drive on roads and connect to an overhead railway. Others are more near term, like the development of methanol, a drop-in fuel made from natural gas that's cheaper and cleaner than gasoline. On a trip to Israel in March, President Obama toured one of the initiative's partner companies, the metal-air technology developer Phinergy. After five years of development, Phinergy demonstrated its aluminum-air battery range extender last year on an electric vehicle capable of traveling more than 600 miles, running solely on water, while producing zero emissions. The Phinergy hybrid car. Its aluminum-air battery has a range of more than 600 miles. Photo courtesy of Phinergy. The vehicle prototype features a dual system architecture that brings together a lithium-ion battery and an aluminum-air range extender. The lithium-ion battery charged by the power grid is used for everyday short-range commuting -- like any other plug-in hybrid vehicle. But instead of using gasoline for longer journeys, the vehicle is propelled by an aluminum-air battery, creating energy through the reaction among aluminum, water and ambient air. "The battery 'breathes' oxygen from ambient air, releasing the energy from the metal anode," said Judith Yavniely, business development manager at Phinergy. In the past, metal-air batteries would fail before 100 hours of operation. Phinergy overcame this by developing a more robust air electrode that allows the battery to be used repeatedly by replacing the cell's aluminum plates roughly once per year. The company claims the nascent technology is already cheaper than what lithium-ion batteries are expected to be in 2020. Phinergy's vehicle prototype is one of 15 pilot projects funded by the Fuel Choices Initiative. The company is now planning to launch a large-scale demonstration. "We feel now there's a strong will in Israel to push the technology for alternative fuels, and this has helped us very much in finding partnerships and good exposure," Yavniely said. Another Israeli startup, CellEra, has developed a new form of chemistry to create low-cost, platinum-free fuel cells. With the help of the initiative, the company is already piloting the technology for stationary use and is working with Volkswagen and another unidentified automaker to deploy it in a vehicle in 2020, said Ziv Gottesfeld, co-founder and CEO. Like many Israeli entrepreneurs, Gottesfeld's background is in information communication technology (ICT). The clean tech world, he said, operates on a very different timeline than the ICT industry, making it a far greater challenge to cross the so-called valley of death to reach financial sustainability. The fate of Israeli electric car startup Better Place is a reminder of just how treacherous the valley can be. The much-hyped company filed for bankruptcy last year after selling just 750 cars and bleeding more than $500 million. Better Place sought to revolutionize transportation with battery-swapping stations that would replace an electric vehicle battery in minutes, so drivers didn't have to wait hours for a charge. Today, the blue and white swapping stations that line Israel's highways sit dark and abandoned. There is currently no plan to reopen or repurpose the stations, according to Rosner. 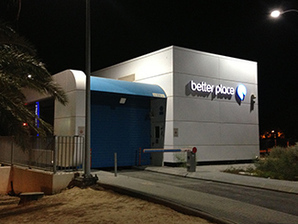 Experts have speculated that Better Place met its demise due to regulatory hurdles and a lack of government support, the fact the company only offered one family-sized sedan by Renault, and the $500,000 price tag per swapping station. By comparison, Tesla Motors' solar-powered Supercharger stations are said to cost $250,000 at most. Leaders of the Fuel Choices Initiative are looking to avoid these types of potholes. According to Gottesfeld, the program "is a very good example of how exactly to address the key challenge of crossing the chasm, which in the clean tech space is wider than others." Over the decadelong period it's scheduled to run, the program has been budgeted $400 million. The figure may seem paltry by U.S. standards, but supporters note it's a substantial commitment for a small country. The funds are also designed to leverage private capital and philanthropic donations. An abandoned Better Place battery-swapping station outside Jerusalem. 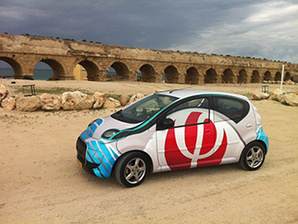 The Israeli electric car company filed for bankruptcy last year. Photo by Julia Pyper. "We hope that over time people will see not only money we're offering but also the infrastructure we're supporting," Rosner said. "Altogether we're trying to create an environment that will make people understand that it's a serious business and the government takes it seriously, so hopefully they will come to invest as well." Last fall, Israel hosted an alternative fuels summit that drew industry leaders from across the globe, including the U.S., China and Brazil. If Israel is to have a meaningful effect on oil consumption, it cannot do it alone, Israeli Prime Minister Benjamin Netanyahu said at the conference. "Oil has dominated global energy markets for the last century, and this is nowhere more pronounced than in the transportation sector that accounts for nearly two-thirds of global oil consumption," he said. He added that this reliance has lined the pockets of unstable regimes, inflated energy prices and limited nations' ability to reduce greenhouse gas emissions. Through cooperation with larger, more energy-consuming countries, "it's within our power to change the automotive industry, the way people use fuel, to have fuel choices," Netanyahu said.